If you have an ant problem in your home, chances are that you haven’t seen just one running around, but rather an entire colony. Ant colonies can contain millions of tiny ants. You may only see a few at first, but it won’t take long before you realize how many have actually moved into your home. This is why you should contact Eastland as soon as you see the first ant. We never want to see our customers have to suffer from a problem like an ant infestation. Ants are determined little insects, known for their ability to survive even in the harshest conditions. 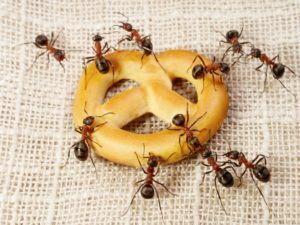 If you have kids who may drop food crumbs throughout your house, or anyone for that matter, ants see this as an easy target that they must reach. Besides food, ants love to gather around areas like the bathroom and kitchen where moisture is easily accessible. You may not think that ants are that big of a problem when you see one tiny little black ant on your floor. It is one thing to kill the ants that you see throughout your house; the harder thing to do is to kill the entire colony, eliminating their habits completely. We strive to not only exterminate your entire ant problem but also to use preventative care in order to give you peace of mind for future ant control. Fire ants are an invasive species that do not have natural enemies in our area. They are reddish in color, about a quarter inch long, and pack a nasty sting. Fire ants can ruin the beauty of your lawn and cause problems with electrical systems, including damage to central air units. Fire ants can also trigger allergic reactions in some people and pets. Eastland offers a guaranteed solution to your fire ant problem. We typically treat your yard twice a year. When you enter our Fire Ant Management Service you will be completely guaranteed. So if they come back in between your visits, so will we! We offer two monthly packages that will include the Fire Ant Management Service. These packages make paying for your service easy and convenient. Click here for more details.